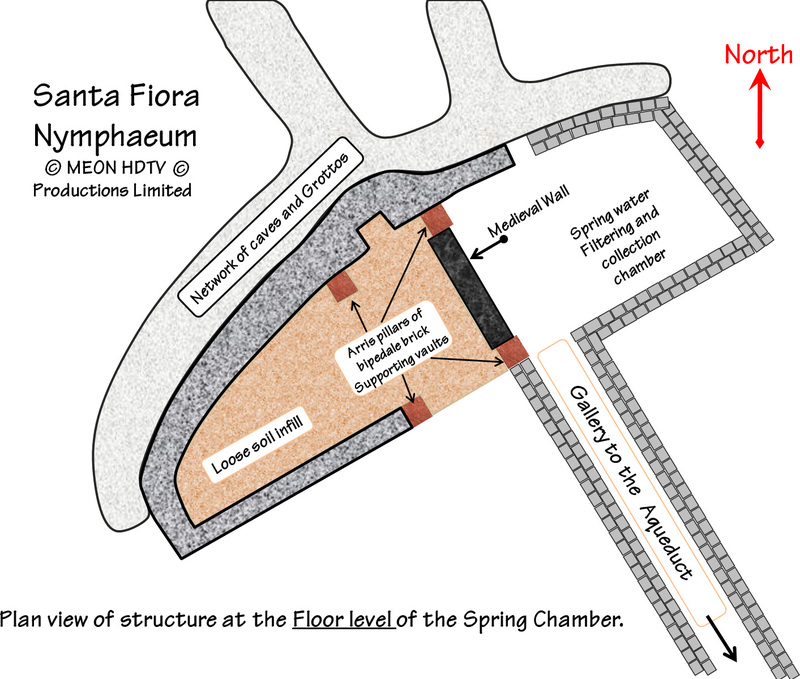 To the right of the central chamber is the most interesting chamber in the complex, the spring chamber. The original archway leading into the spring chamber has been blocked with random building material after the original date of construction. 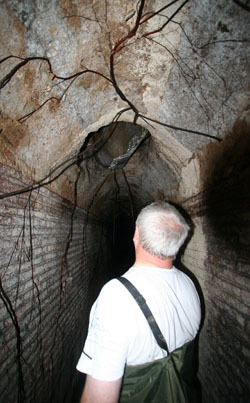 However a small doorway still leads from the Central Chamber through the top of the archway and emerges near the ceiling of the Spring Chamber. Descending another four meters, with our cameras and lights, we were able to illuminate the most spectacular piece of archaeology that we had seen so far. The base of the walls on three sides of this chamber consists of very large blocks of volcanic stone with gaps inbetween them to allow water to filter through. We have observed from places where a blocks have fallen out of place that behind each row of blocks is another row of identical blocks. 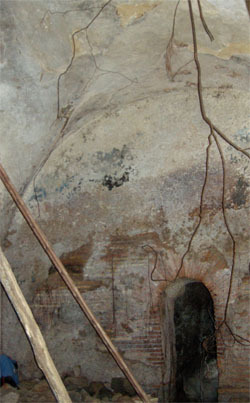 Above the filtration blocks, there is a layer of tile, and waterproof brick walls which support the cross-vaulted roof. One large chunk of vaulted ceiling is missing immediately above the entrance to the filtration gallery that subsequently becomes the aqueduct proper. One of the spring-chamber walls is very different from the others. The side wall between the spring chamber and the central church chamber has a thick strong brick pillar at each end supporting an arch which reaches to the ceiling. This arch is filled with rough hard-core material from a later date, which serves as a supporting wall for the church floor at a higher level. Thus the shape of the complex has clearly changed since its original construction. Above the level of the large blocks, the chamber is made of brick, lined with layers of cocciopesto. Cocciopesto is a type of hydraulic cement which uses shards of brick or small pieces of pozzolana ash mixed with cement for impermeability. The cocciopesto was painted with blue paint. Our associate the art restoration specialist M. Cristina Tomassetti has analysed this paint and ascertained that it is Egyptian Blue paint, a very expensive type of paint that was only known and used in Roman times. Above the bricks there are two layers of cocciopesto, a layer of hard-surface made from crushed marble and lime, and a layer of paint. In both the curved wall and the front wall of the Spring Chamber open two arches. 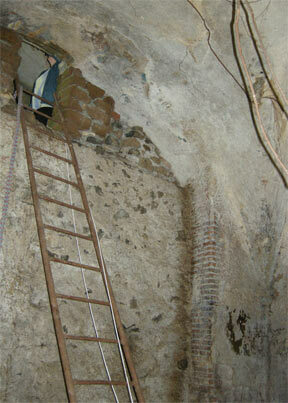 The arch of the curved back wall is of width 70cm and accesses some rough pozzolana caves. The second arch is 90cm wide and leads into a water-collecting tunnel and to the start of the Aqua Traiana. To the west corner of the spring chamber, a finely built brick arch with curved bricks opens into a 90cm wide tunnel which features the same filtration blocks. 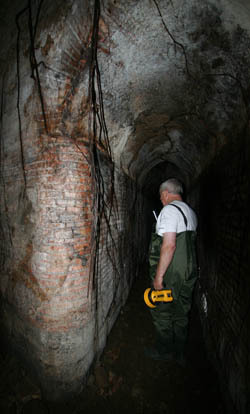 The first pozzo along the duct is circular and blocked at a low level. The arch at the southern-most corner of the Spring Chamber leads into a tunnel which is not the aqueduct itself, but still part of the water filtration mechanism with water filtering bricks. Further down the tunnel the aqueduct begins.